Godzilla movies have the reputation of cheap entertainment for indiscriminating children, and Godzilla vs. Megalon is one of the films largely responsible for that belief. Its low-budget nature is so obvious as to be laughable to everyone except small children, and even they may find it lacking in the face of today's special effects. Still, it does feature the big G (two versions of him, even), an alien invasion plot (sorta), and enough giant monster action to keep most kaiju fans entertained. The undersea kingdom of Seatopia, which features the best stage shows this side of Vegas, is angry at the surface world because of recent nuclear testing in the Pacific Ocean. While the Seatopians are highly advanced in the areas of monster control and interpretive dance, their powers of deductive reasoning are a little rusty, because they immediately start picking on Japan, which is the last country that would be testing nuclear weapons in the Pacific. The Seatopians send earthquakes and their pet god/giant monster Megalon to kick the stuffing out of all the buildings that the movie's meager budget could afford. In fact, that number is basically one, if a dam counts as a building. 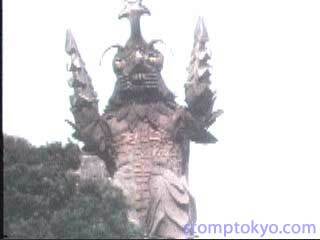 All the rest of the building destruction footage is from earlier films, particularly Ghidrah, the Three Headed Monster. "Next I'm going to build a Zero!" Against this awesome assault only one force can stand: Kenny. Yes, the annoying kid in the incredibly short pants shows up for another round of monster fun. 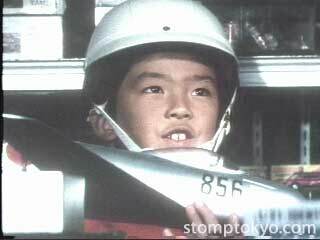 In this film Kenny is disguised as a boy named Rokuro, and he's played by the King of all Kennys, Hiroyuki Kawase. Kawase played the equivalent role in Godzilla vs. Hedora and Time of the Apes. He's particularly annoying here because of the shrill American voice dubbed over his own. Clearly Toho used the same studio that dubbed all the Shaw Brothers kung fu films, because, as in those films, the phrase "But still..." is used repeatedly to mask awkward inconsistencies between dialogue and lip movements. Rokuro's much older brother Goro (Katsuhiko Sasaki) has invented a robot named Jet Jaguar that is controlled by a pendant with a microphone. This flying robot is a vital part of the Seatopians' plan, because while they can dispatch a giant monster to Japan, they apparently need a human-made robot to lead it around. The parts of the movie that don't feature giant monsters are essentially about the mad scramble for control of Jet Jaguar between the overly hairy Seatopians and the plucky Japanese inventors. Rokuro, apparently the president of the Japanese Engineers Who Favor Primary Colors, has more pluck than twenty Anne of Green Gables novels. Considering that the Godzilla costume was literally falling apart in the last Godzilla film (Godzilla vs. Gigan), it's not surprising that a new suit appears in this movie. And what a suit it is. It's Godzilla crossed with Kermit the Frog. Behold, the terrible... Mup-zilla! Raaaaarrhrhrh! But it's not easy being green. 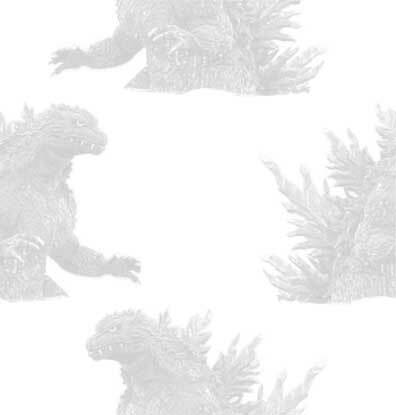 If you watch closely, you'll notice that there are actually two Godzilla suits in the film. And we don't mean a stunt suit used for water sequences or anything like that. Megalon ups the stock footage quotient by using large chunks of monster footage from Godzilla vs. Gigan. 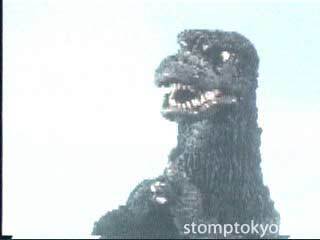 Sure, Godzilla films had been cannibalizing shots of buildings falling down (and that one guy hanging on to a tree against the wind) from earlier films for years, but only this film and Godzilla's Revenge used major monster sequences from an earlier movie, and Godzilla's Revenge was supposed to be a dream! If the flip-flopping versions of Godzilla were the strangest thing in the movie, we might be inclined to treat it more kindly. Jet Jaguar, however, is one of the most reality-defying robots we've ever seen. First of all, he seems to have a working artificial intelligence that was programmed into him with punch cards. 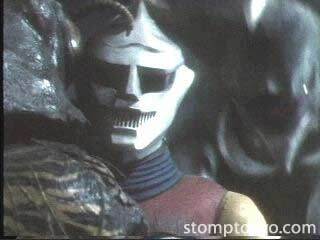 And, in a scene that will literally blow the mind of anyone moderately involved in the continuum we call "the real world," Jet Jaguar "decides" to increase his size from that of a human to that of Godzilla, so he can wrestle around with Megalon, Godzilla, and Gigan, who makes a surprise appearance to even things out. (Gigan is on loan from the aliens in the last movie, though philosophically the pollution-happy aliens should be a bad fit with the Seatopians.) 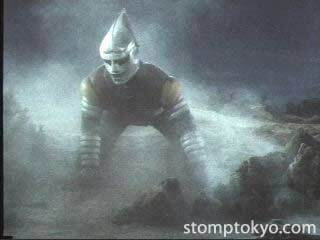 The explanation given for Jet Jaguar's compromise of the rules of conversation of mass is that he "just programmed himself in someway to increase in size." Boy, he's living Bill Gates' dream. "...and the field goal is good!" Megalon is a lame excuse for a monster, a beetlish creation with drill-arms and a corkscrew head that allow him to burrow under his opponents. This isn't even the worst bit of fighting in the film -- when surrounded by a ring of flames, Godzilla must be rescued from the fire by Jet Jaguar. At this point we were wondering who the giant lizard on screen was and what he had done with our indestructible pal Godzilla. As inclined as we are to treat giant monster films kindly, Godzilla vs Megalon is one of the poorer moments in rubber suit history. Even if it weren't for some unfortunate editing (apparently done by American censors to get around some nudie pin-up shots in the cab of a truck), this film features one of the least coherent plots to date. With its fairly mundane robot-vs-alien-invasion setup, it doesn't even have the excuse of a psychedelic script. Compared to Godzilla vs the Sea Monster, which had a dance contest, a shanghaied sailboat, a bank robbery, and a ring of international terrorists holding an entire island hostage before Godzilla even showed up, Megalon can hardly lay claim to boatloads of excitement. It's more of an excuse to stimulate young Japanese kids with brightly-colored toys.